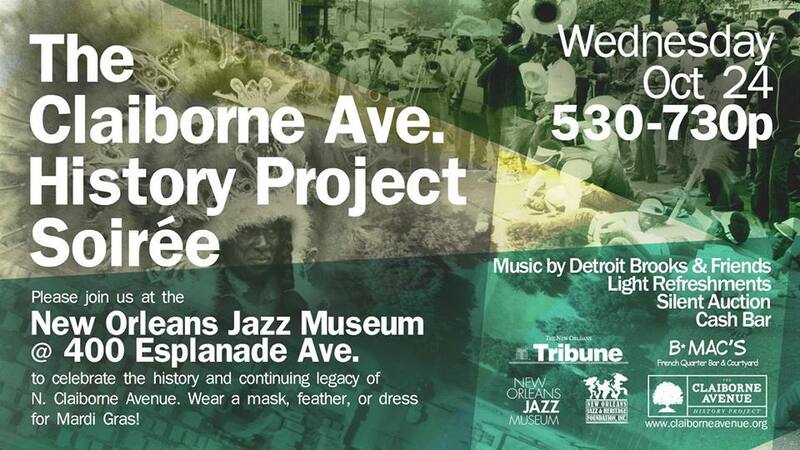 Join us at the New Orleans Jazz Museum on Wednesday, October 24, 2018 from 5:30 pm to 7:30 pm for the first annual The Claiborne Avenue History Project Soirée. The CAHP team will introduce the project giving you a snapshot of the great history of North Claiborne via video from the ongoing CAHP documentary, Detroit Brooks and Friends will play music popular in clubs along North Claiborne during the 1950s, and we will have a cash bar, light refreshments, and a silent auction. CAHP is a multi-platform documentary project that collects and curates history about North Claiborne Avenue focusing on civil rights, culture, and commerce from the Avenue’s heyday in the early 20th century, through its demise with the 1966-69 construction of the I-10 highway, and into North Claiborne today. This project places North Claiborne Avenue within its historical context as a commercial and cultural center for the African American community.